Plunge into four shimmering cenotes nestled in the Yucatan jungle on a full-day cenote adventure from Playa del Carmen. Snorkel in, zip line over, kayak around and rappel down to these incredible natural formations on an action-packed adventure amid the spectacular scenery of the Mexican rainforest. Gain insight into the physical attributes and ancient formation of these stunning sinkholes with an experienced and knowledgeable guide. Feast upon cookies, chocolate and a delicious picnic lunch during day, which also includes round-trip transportation from your Playa del Carmen hotel. Fahren Sie von Ihrem Hotel in Playa del Carmen in einem komfortablen und klimatisierten Minivan ab, um Ihre aufregende Expedition zu beginnen. Lehnen Sie sich zurück und bewundern Sie die malerische Landschaft, während Sie an Gebäck knabbern und einen aromatischen Kaffee trinken. Hören Sie dann zu, während Ihr Reiseführer Einblick in die Geologie und Ökologie der Halbinsel Yucatan bietet. Kommen Sie im atmosphärischen Xenotes Oasis Maya an, einem neuen Park, der von Experiencias Xcaret betrieben wird, und beginnen Sie Ihre Reise zu den vier atemberaubenden Cenoten, von denen jede ein anderes Element darstellt. Beziehen Sie sich auf die faszinierende Erklärung Ihres Führers, wie die Cenoten von Mayas für Opfer und spirituelle Zwecke verwendet wurden, während Sie das üppige Grün und die einzigartigen Klänge des Dschungels bewundern. Nähern Sie sich der ersten Feuer-Cenote und springen Sie in ein komfortables Kajak, um die geheimnisvollen Gewässer zu erkunden. Paddeln Sie im Umkreis herum, um die wunderschöne Umgebung und das mystische Ambiente im Dolinenloch zu genießen. Erfrischen Sie sich nach jeder Cenote mit einem nachgiebigen Champurrado, einem traditionellen Schokoladengetränk und Keksen für einen belebenden Snack. Als Nächstes legen Sie Ihre Schutzkleidung an und schnallen Sie sich an, um die Fahrt Ihres Lebens bei der zweiten Wind-Cenote zu genießen. Steigen Sie mit Ihrem Hochgeschwindigkeits-Seilzug über den glitzernden Pool, bevor Sie in das klare Wasser eintauchen, das von krümeligen Kalksteinwänden umgeben ist, um ein erfrischendes Bad zu genießen. Hören Sie dem mächtigen Strom schnell fließender Flüsse zu, während Sie die Wände der dritten ´Eden'-Cenote zu den einladenden Gewässern darunter abseilen. Beobachten Sie, wie sich Bäche durch die sich windenden Tunnel und tiefen Höhlen schlängeln, während Sie in die unterirdischen Tiefen absteigen. Sehen Sie auch die letzte "Wasser" -Cenote, eine faszinierende Formation mit schroffen Felsformationen und vielfältiger Tierwelt. Schnorcheln und tauchen Sie ein in das erfrischende Wasser, um in diesem harmonischen Unterwasserwunderland Seerosengärten und farbenfrohe Fische zu entdecken. Genießen Sie ein köstliches Picknick-Mittagessen während der Rückfahrt zu Ihrem Hotel. Verwöhnen Sie Ihren Gaumen mit Fusilli-Gemüsesuppe, einer erstklassigen Auswahl an Käse und Wurstwaren sowie rustikalen Broten und frischen Salaten. Genießen Sie während Ihres Mittagessens kostenfreie Getränke wie Kaffee, Wein, Bier und Wasser. Anschließend können Sie sich auf eine kurze Reise zu Ihrem Hotel in Playa del Carmen begeben. Best tour ever !! Rapelled into one cenote, ziplined into another, kayaked in another, swam in another. Was a fantastic day. Everything was so beautiful and pleasant. We really enjoyed our small group and all the different activities. This isn't a lazy excursion - lots of swimming and other physical activity. It's also a wonderful way to experience the cenotes. Really fun tour. Zipped lined, snorkeled,repelled, and swam all in the different cenotes we saw that day. Plus some other activities. We also saw many different aged cenotes which was really interesting. Eduardo was our guide, Andy was our photographer ,and they were great. They really made sure everyone had a lot of fun. Definitely ask for them. Overall, a fun day for my whole family. I would definitely recommend this activity/tour. We absolutely loved this tour! Most favorite part of our trip. Something fun for any adventure seeker. They provide, water, bio-degradable sunscreen, showers, towels, snacks/lunch, drinks etc. We loved repelling, kayaking, zip lining, cliff jumping optional, swimming under water falls. It was beautiful. We saw so much wild life on the tour to. Beautiful pictures. The only thing I would change is the photographer that they have help with the tour charges kind of a lot for the pictures. We would have bought them had they had been a little cheaper. Lunch was good and simple. Bathrooms and showers were nice at all the Cenotes. We recommend water shoes or closed sandels because of the frequent change of cenotes and land. The bus was air conditioned and picked up/dropped off at our hotel. Our guide was wonderful and made us feel like family! Cant wait to go again. Highly recommend for couples and families with children over 6. Vladimir was a wonderful tour guide. We thoroughly enjoyed our tour through the five cenotes and highly recommend it to anyone who loves adventure! We had a wonderful time. I would highly recommend this excursion. The one thing I was not happy with was the photographer, Jamie that traveled with the group and took pictures throughout the day. Be careful of this. He is very good and did take great photos, but as he tells you the photos will cost 50.00 to access them on the internet. He doesn't tell you that it will cost another 79.00 to upload them without the Xenotes logo plastered on the photo. This I thought was a total rip off. Yoshua was our tour guide and he was not only very knowledgeable about the jungle and cenotes but super funny! Snorkeling, kayaking, cave descent and just viewing everything around was amazing. The snacks and refreshments were after every stop! They really catered to the group and it was so much fun. It is well worth the money and the time! With transportation provided it was super convenient. I really recommend this trip!!!! My 9 year old daughter and I went on this tour last month. It was a really fun day. 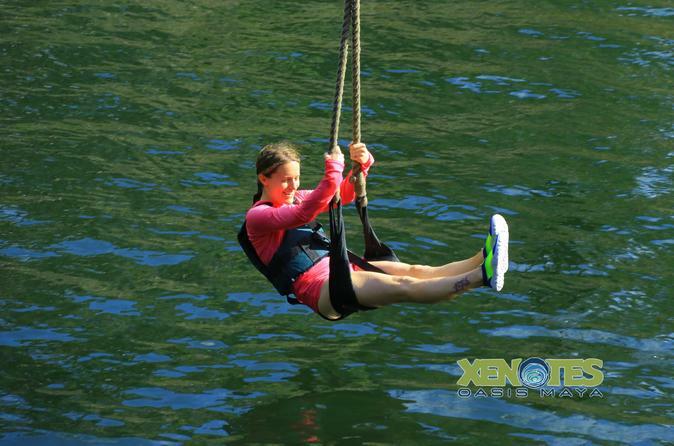 There was ziplining, kayaking, swimming, and even jumping off cliffs if you were so inclined. I was initially nervous about signing up because of all the activities but none of them were too strenuous and if you really didn't feel comfortable doing something, you could easily opt out. There were many activities throughout the day which kept the day interesting and you were able to see many different types of cenotes as well as learn a little about them and how they were formed. The lunch was very good and the tour guide spoke both English and Spanish so no one felt left out. Very good. Lots of fun. The guides take real good care of you. The meal is also very satisfying. 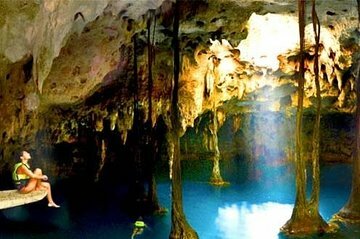 Travel provided via shuttle to 4 different cenotes and events. It was organized and executed really well. Lunch was delicious. The guides and staff were knowledgeable . Highly recommended!